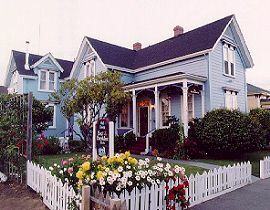 The "Old Town Bed & Breakfast Inn" is an 1871 restored Victorian home located at the edge of Old Town in the historic seaport village of Eureka. Old Town features many shops and restaurants, all within walking distance of the Inn. Eureka is a short drive to Pacific Ocean beaches, nearby redwood parks, wildlife refuges, and Humboldt State University. All four rooms are decorated with period antiques and hand-made quilts. Each room has a private bath and TV/VCR. A large collection of Academy Award winning movies are at your disposal. A full gourmet country breakfast is served in the morning. Room rates range from $110 - $150, and we offer business rates and senior discounts. Major credit cards are accepted. Pets and children can be accomodated with prior arrangement and for an extra charge. This property is now closed. This and other Eureka Bed and Breakfast Inns can be found here in The Register.